One of the greatest struggles that most of us will face in life is the quest for happiness, a search to find joy and satisfaction in the life that we’re living. However, with only 33% of Americans reporting that they are feeling happy in a 2017 Harris Poll, it appears we’ve got some work to do! While most of us will experience both times of extreme happiness and times of trial, we all know at least one person that walks through life as though there’s a dark cloud permanently over their head. Even faced with reasons to celebrate, they somehow turn it around to find the darker side of the situation. While they often play the victim, believing that they have been dealt a horrible hand in this life, the truth is that they may be responsible for their own toxic energy. #1 – They genuinely believe that life is hard. Have you ever heard of the concept that you can think something into existence, a self-fulfilling prophecy? Those who are chronically unhappy truly believe within their hearts that life is going to be a constant battle, one that they can never win. For this reason, they are blind to all that is good. Rather than recognizing the highs and lows, they see nothing but a dark, endless black hole. #2 – They constantly jump to conclusions. Rather than taking the time to look into a situation further or to allow it to play out, they instantly assume that everything they are facing is inherently bad, will be bad and there is no way to avoid it. This acceptance of their ‘doomed outcome’ in life causes them to overlook any hope or happiness. #3 – They are too quick to throw in the towel. Times are going to get tough, and you are going to be challenged. However, if you want to come out ahead in life you need to be willing to fight for it. Chronically unhappy people are missing this resolve in life. Instead, when faced with a challenge they simply throw in the towel and walk away from the potential for happiness and success. #4 – They make poor dietary choices. The food that you put into your body is your fuel, providing you with the energy to carry out your daily activities. Experts have drawn a connection between our food choices and our mental health. Those who maintain a healthier diet report fewer mental health struggles. These individuals often fill up on ‘junk food’ including processed foods, sugary snacks, and fast food. #5 – They long to have control over every aspect of their lives. While there are certain aspects about our lives that we have full control over, such as the way that we choose to respond to life’s trials and challenges, but the world is a messy, unpredictable thing. If we spend all our energy trying to control every aspect of it, we will be left with nothing but worry. This is the downfall of the unhappy. Rather than enjoying the ride, they are constantly worried about the unknown and uncontrollable. #6 – They make everything about them in this life. Have you ever met that person that can somehow take any situation and spin it so that it’s about them, even if that couldn’t be further from the truth? Feeding off the drama and pain in life, chronically unhappy somehow insert themselves into every situation, making themselves the victim. #7 – They see happiness as a destination as opposed to part of the journey. There is so much that we can enjoy and experience in our daily lives, all part of this exciting journey that we call life. The chronically unhappy, however, fail to see this. Instead, they see happiness as something that is always just out of their reach, something unattainable. #8 – They are quick to place the blame on everyone and everything else around them. No one is perfect, we are all going to make mistakes in life. However, when things don’t quite go according to plan, it’s a great opportunity to grow and evolve. Passing up this chance for growth, chronically unhappy people refuse to take responsibility for their actions. Instead, they instantly point the finger at someone or something else. #9 – They constantly worried about money and finances. This isn’t to say that you shouldn’t be aware of your financial state and working towards improvement where possible. However, there are going to be times in life where you simply need to step back and appreciate where you are in life and the money that you have available to you. Living in a first world country, you have the opportunity to experience a financial security that many around the globe will never see. Chronically unhappy people fail to see this, worrying about money even when everything is aligned in the best way possible in their lives. They’re never content. #10 – They regularly engage in gossip and complaining. Every time that they open their mouths, all that comes out is negativity and frustration. They bring upset and hurt to others by constantly sharing gossip and complaining about everything around them. This negativity has a way of coming back around to bite us in the long run. Furthermore, in order to share gossip, one must focus their attention on this negativity in the first place. Why promote such a toxic energy? #11 – They pass up opportunities for growth and discovery. Every situation that we face in life provides us with an opportunity to grow, change and evolve. This growth allows us to discover new things about ourselves, as well as new things that we enjoy in life, things that bring us joy and happiness. However, those who are chronically unhappy become stagnant in their lives as they avoid new opportunities and experiences. They may just be closing the door to the very thing that could bring them happiness. #12 – They hold grudges, refusing to let go of their pain. When someone does something to hurt you or upset you, it definitely brings a negativity into the world, however, in time forgiveness and an ability to look forward will allow you to move past this moment and find happiness once again. Chronically unhappy people refuse to practice forgiveness, holding a grudge and, in doing so, holding onto the toxic energy that it introduces into their lives. #13 – They sweep major issues under the carpet instead of dealing with them. There are going to be serious issues that arise in your life, demanding your attention. The key to quickly resolving and moving past them is to identify and address them as quickly as possible. After all, shelving them for any length of time will only give them the opportunity to fester and impact your life worse. Rather than facing the potential challenge of addressing these situations, chronically unhappy people embrace the idea of hiding them from the world. However, out of sight does not mean out of mind, and they are never free from the negativity. 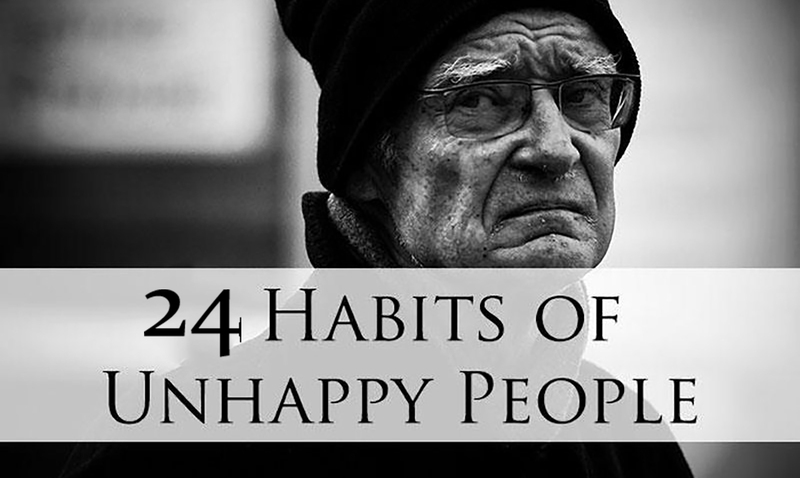 #14 – They are constantly focused on the negativity in their life. Throughout our lives, we will all experience great highs and heart-breaking lows, major accomplishments, and significant challenges. It is your choice as to what you will focus on most, but that focus can have a significant impact on your mental state. Once could choose to focus on the reasons to be happy, bringing joy into their lives. These individuals, however, choose to focus on the pain, hurt and heartbreak. In doing so, they invite negativity into their life. #15 – They have a pessimistic outlook about the future. If there is one thing that has been proven to get people through life’s biggest challenges, it is the ability to focus on hope for the future. While there are some things about the future that we can predict or anticipate, most of what is to come is unknown. Chronically unhappy people look to the future and they believe it will bring nothing but doom, gloom, and struggle. This prevents them from finding the hope that the future can bring. #16 – They are lazy, failing to engage in physical activity. There is a well-known connection that exists between regular physical activity and improved mental health. This is due to the hormones that are released when we are active, which trigger the pleasure and reward centers of the brain. Those who are unhappy are often ‘lazy’, living their lives seated in front of computers and television screens, rather than getting out and getting themselves moving. #17 – They struggle to let down their barriers and trust strangers. Due to their inability to trust others, they keep everyone that they meet at a distance, building walls and barriers to keep everyone out. Unfortunately, this prevents them from establishing meaningful connections and relationships. We are wired to seek human connection, and the absence of this (at their own hand) robs these individuals of a key opportunity to find happiness. #18 – They focus far too much attention on what others think of them. Instead of learning to love themselves, and allowing that self-respect and appreciation guide their lives, chronically unhappy people look to the approval of others. They allow their self-worth to be formed based on these outside opinions, which are not always going to be positive. After all, you’re not going to be ‘the person’ for everyone! Without realizing that happiness comes from within, they find that it’s always out of reach. #19 – They fail to set goals and dreams for their lives. It is our focus and resolve for where we are going in life that helps to pull us through some of the world’s most difficult challenges. Without that light at the end of the tunnel, one is left with nothing but darkness, no direction or hope for the future. Not only does it improve your chances of success to set a solid, defined goal, but it also works to pull you through the struggles. #20 – They are constantly comparing themselves to everyone around them. Comparison is one of the biggest killers of happiness and joy in our lives. Why? There is always going to be someone that appears to be happier, more satisfied with their lives and more successful than we are, regardless of how well we’re doing. This leads to nothing but self-doubt and self-degradation, obviously hindering one’s ability to be happy with themselves and their life. #21 – They regularly demonstrate extreme selfishness. It has been said that one secret to happiness is the ability to bring happiness to others, but this is a concept that is completely foreign to the chronically unhappy people who live among us. Instead, they spend all of their time focused on ‘me, myself and I’, neglecting the joy they could find through connection with others. #22 – They regularly overexaggerate and blow things out of proportion. You are going to face struggles and challenges in life, that is inevitable. When these times come upon you, it is up to you and only you to determine how you are going to respond. Chronically unhappy people fail to put their life into perspective, allowing even the smallest of setbacks to blow up into some major life-changing battle. They make mountains out of molehills, making their life even more difficult than it needs to be. #23 – They try to fill the void in their lives with material things. Chronically unhappy people often fall for the misconception that happiness can be bought with the biggest house, the newest car or the latest gadget. They work their lives away in pursuit of money and material belongings. When their latest purchase fails to bring the happiness that they seek, they set their eyes on the next purchase. Throughout all this, they fail to see the moments of happiness and joy at the moment. #24 – They fail to discover and express gratitude. It’s a phrase that we hear from so many self-help gurus and coaches – the importance of developing an ‘attitude of gratitude’. The concept is that if we can step back and see all that we have to be thankful for in this world, we can then focus our attention on all the reasons for happiness and joy in our lives as they exist today. Blind to this, chronically unhappy people see reasons to be upset or defeated instead.